I mentioned last month that Amazon had five free video games for Amazon Prime members. All you had to do was link your Amazon Prime account to your Twitch account and you could select and download the games. This month, to coincide with Prime Day and such, Amazon has a bunch of games available. Each are available only for a couple of days, and the first on the list is the excellent Pillars of Eternity: Definitive Edition. That game is only available through the end of the day tomorrow, July 4, 2018. So if you’re reading this after that date, it’s gone. To claim the game you need to have a Twitch account and have the Twitch Client installed. The Twitch Client used to be the Curse Client until Amazon bought Curse and Twitch and combined them. It still keeps your WoW addons up to date, but you can also watch Twitch on it… and download free games. When you have that setup you can go to the Twitch Prime page, login to your Twitch account, link your Twitch account with your Amazon Prime account if you have not done that already, and then claim the games in which you are interested. Once you have click claim on the web site the game will be available to download in the Twitch client. Other games are available over the course of the month. Amazon is clearly trying to push Twitch into the arena of online game sales to compete with Steam, GoG, and whoever. As Ars Technica points out, the Twitch interface is a long way from anything like Steam when it comes to information or utility. This entry was posted in entertainment, Other PC Games and tagged Amazon, Amazon Prime, Curse Client, Pillars of Eternity, Twitch, Twitch Client on July 3, 2018 by Wilhelm Arcturus. I read through the FAQ, and may have missed it, but do you know if access to games is retained if the Prime subscription is stopped? 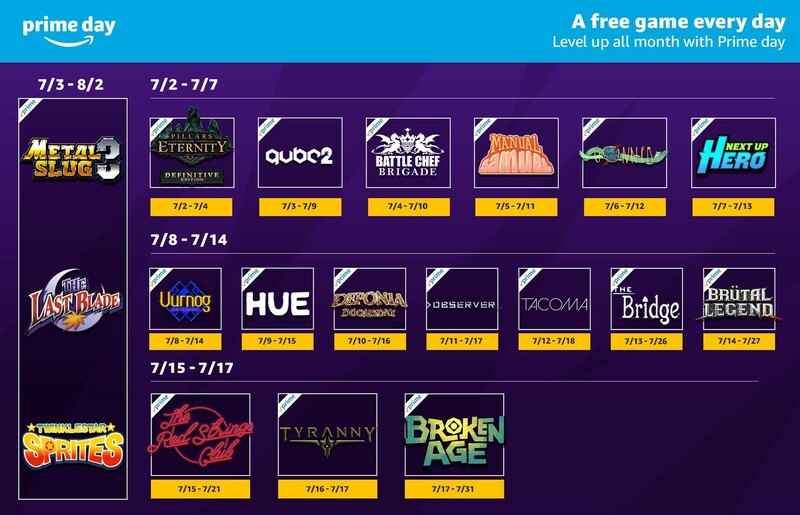 That may wind up being a key point in the competition with Steam and GoG. @Test – From what I read, there is no DRM and the games are yours to keep if your Prime subscription expires or is cancelled. I think the Ars article I linked to has that in it. I have a knee-jerk aversion to getting further entangled in the Amazon web, but this bait was just a little too enticing. Thanks, I think. Thanks for the heads up. Downloading PoE now. I would have missed it because although I’d remembered there’d be new free games this month I foolishly imagined they would be available to download for the whole month. Probably not going to bother with the rest of July’s offer but I might look a few of them up just in case – the names mean nothing.